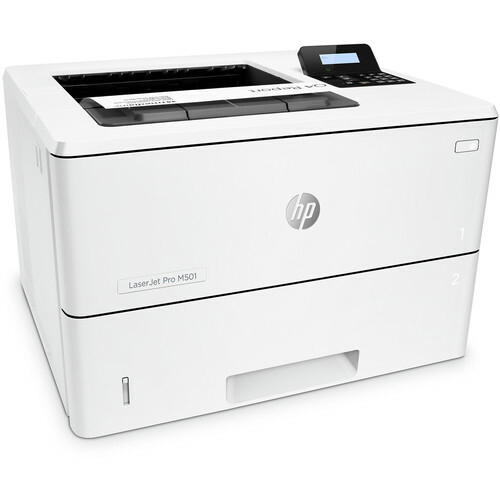 Print quickly, efficiently, and securely with the LaserJet Pro M501dn Monochrome Laser Printer from HP. Able to produce 45 pages each minute and get the first print out in just 5.7 seconds, this printer will dramatically increase the productivity of your office. It also has automatic duplexing at up to 36 ipm for saving on paper. The relatively compact unit also features both a 100-sheet multipurpose tray, which supports media from 3 x 5" up to 8.5 x 14", and a standard 550-sheet input tray for working with all common paper sizes. It is easy to use as well, with USB 2.0 and Ethernet connectivity and support for multiple mobile printing protocols. Additionally, it has a monthly duty cycle of 100,000 pages and offers a two-line backlit LCD and a numeric keypad for checking status and entering data. Print speeds of up to 45 ppm as well as duplex printing at up to 36 ipm. First print out speed of 5.7 seconds. Mobile printing is possible using HP ePrint, Apple AirPrint, Google Cloud Print 2.0, and Mopria-certified protocols. This printer features a monthly duty cycle of 100,000 pages with a recommended monthly volume of 1500-6000 pages. Smart software features include N-up printing, collation, HP Auto-On/Auto-Off Technology, JetIntelligence Cartridge Technology, and built-in job storage with PIN printing. Printer management is possible using the UPD Printer Administrator Resource Kit, Active Directory Administrator Template for UPD, AutoUpgradeUPD, Driver Configuration Utility, Driver Deployment Utility, Managed Print Administrator, PRNCON.EXE, HPPRLOG, Migrate-ServerTools, UpdateNow, RemovePlugPlayDrivers, HP Web JetAdmin Software, HP Proxy Agent Software, HP JetAdvantage Security Manager, HP Utility (Mac), and HP Device Toolbox. The 550-sheet input tray can accept media from 4.1 x 5.8" up to 8.5 x 14". The output tray can hold up to 250 sheets. Works with paper (plain, EcoFFICIENT, light, midweight, intermediate, heavy, extra heavy, bond, cardstock, colored, letterhead, preprinted, prepunched, recycled, and rough), envelopes, labels, and transparencies. A 2-line backlit LCD provides current status and access to the menu while a numeric keypad will help with data entry. The printer uses a 1.5 GHz processor and comes with 256MB of memory. Box Dimensions (LxWxH) 19.4 x 18.4 x 15.6"
LaserJet Pro M501dn Monochrome Laser Printer is rated 4.3 out of 5 by 8. Rated 5 out of 5 by Sallie from For someone who prints a lot--this is great. economical So, I had an earlier version of this machine for 16 years--until it ceased to duplex. I haven't had this very long but so far, so good. I like the configuration of controls better, but it is noisier. Still, very fast, good quality print and takes a little less space than my old one. There were machines half the size, but this one gets something like 18,000 (yes, that's right) sheets of print to a cartridge and the others got 1500. So it cost 5 times as much for the same number of sheets with a cheaper machine. If you print a lot, as I do, this is worth the difference and quickly makes up the difference in cost of the machine and the cartridges. Rated 1 out of 5 by Paul123456 from Misleading "Auto duplex printing" feature The third bullet point says "Auto duplex printing", but it is not, it is manual. It prints out the first set of pages which you have to put face down in tray one then it prints the other side. That is not "Auto duplex printing", it is manual printing. And that is a misleading feature. Rated 5 out of 5 by FncCIO from Excellent printer. Fastest time to first page. One of the quickest printers I've ever seen. Not the fastest in pages per minute, but the quickest to spit out the first page. Lovely. Low cost per page, easy maintenance, reliable. Built from thin plastic, that's the only downside. Rated 5 out of 5 by chascsw from Solid printer - exceptional value. If you're looking for a solid performing, black and white printer - this is it. It's easy to set up and all of our machines recognized it on the network. We have a mixed environment with PC's and Macs - no issues at all. Rated 5 out of 5 by Dozerdog from Recommend We are four reams in to our new printer (installed less than two weeks ago) and performance has been perfect. We needed a workhorse and it looks like we chose wisely. Rated 3 out of 5 by David from Printer with Bad Toner Cartridge The printer came loaded with a bad toner cartridge: It would print pages with toner spots on every page. Called HP and was told to call seller. HP would not send us a replacement cartridge. Rated 5 out of 5 by Swim from Good printer HP still makes the best printers even if they are made in China.